Top of the Morning to You! I slept in a wee bit this morning staying up late free motion quilting the string scrappy quilt. Now I am sipping my Chai tea with Sweet Italian cream and honey gearing up to quilt a bit more and then make a pin cushion for a swap. Maybe I will do some blog hopping at the Quilting Gallery's St. Patrick's Day Blog Hop Party. There are 120 participating - those offering give-aways. I really really wanted to have a give away but I have been so busy with work related things and couldn't swing it. 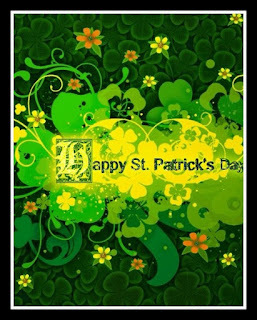 Clicking on the Blog Hop Party avatar will take you to Quilting Gallery's St. Patrick's Day Blog Hop Party. Happy St. Patrick's Day! I hope to visit a few on the blog hop today, too. Have a wonderful day, Joanie!